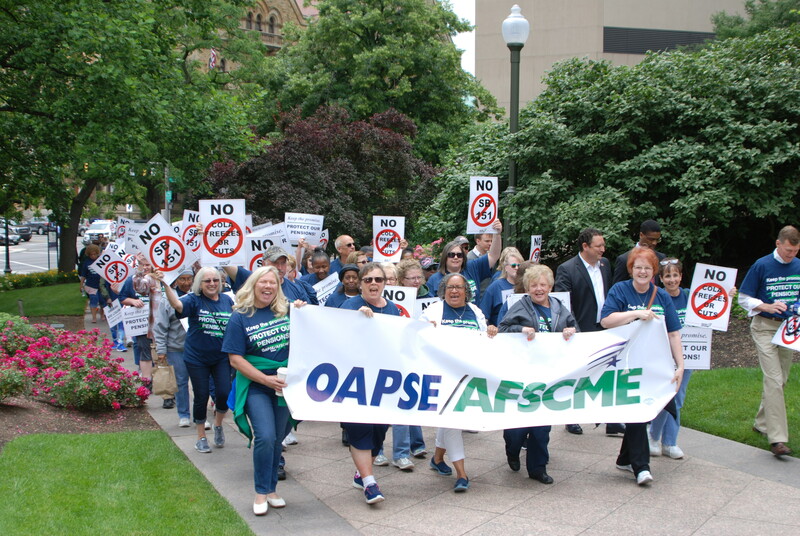 More than 400 OAPSE members and retirees from across Ohio marched on the Statehouse and the School Employees Retirement System (SERS) in opposition to proposed cuts and freezes to cost of living increases for retirees. Chanting “Keep the Promise. 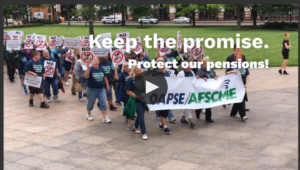 Protect our Pensions!,” the group circled the Ohio Statehouse and paused on the west steps to hear from legislators who oppose SB151 and HB242, bills that would allow the SERS board of trustees to eliminate, reduce and freeze COLAs. SERS was the next stop for the marchers, who had hoped to deliver signed postcards opposing cuts/freezes to the new retirement board director. He declined to greet the OAPSE group. But that didn’t stop the fired-up marchers from respectfully getting their point across. “I am retired and living on my own. I need every penny of my retirement check. So I was glad to join in the march to have our voices heard about these cuts. I’m thankful that the union organized this so active and retired members could come together and demand justice,” said Maryanne Howell, a former OAPSE executive board member and Columbus City Schools employee. She was joined by hundreds of other active and retired OAPSE members at a meeting to detail the proposed changes to retirement benefits. Among those who addressed the crowd was retiree Mark Bailey, who worked for nearly three decades at Kings Local Schools, where workers are represented by Local 27, a union he helped organize. “I guess I thought I was finished with my union work when I retired. But this battle for our retirement security shows that we are never finished fighting for fairness and for what is right,” Bailey said. A 33-year bus driver with Bellvue Public Schools, Lynda Mobley also served as OAPSE state vice president. She made it clear that she worked hard in exchange for her paycheck and a secure retirement. “Now, I count on my pension. And I count on my COLA. To try and solve the problems at SERS by targeting me and retirees like me is just plain wrong. We paid our dues. We did everything right. 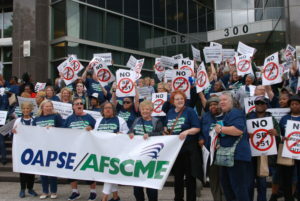 Hands off our pensions,” Mobley told the crowd. Also addressing the fired-up group were OAPSE State President JoAnn Johntony, who vowed the union will never stop fighting for what is right; State Secretary Sandy Wheeler, who underscored that whether active or retired, all OAPSE members are in the fight for justice together; and State Vice President Lois Carson. Carson reminded the group that solidarity and unity are the keys to winning any fight – including the one for retirement security. “No one thought we could win the Senate Bill 5 battle. And we weren’t given good odds to defeat the business community when they tried to take over Columbus City Schools. But we stuck together and beat the odds. We can do it this time, too, because we are united and we will fight for each other,” Carson said. Her union sister, Scooter Tobin, retired June 1, 2017, and said she fears for her economic future because she does not know how her retirement check will be impacted by the proposed legislation or what the SERS board eventually decides to do with COLAs. “I hope I can pay my bills. I want to enjoy this time after all those years of getting up at 4 a.m. to be at the bus garage in time to take my kids safely to school. I hope I can,” Tobin said. Stories of retirees like Scooter, Mark and Lynda motivate the OAPSE Executive Board, leadership and staff every day, according to Director Joe Rugola. “Sisters and brothers, the bottom line is that we simply can’t accept this. And we won’t accept this as the only option to fix the problems that SERS is in because they wouldn’t listen and they didn’t listen to what we have been trying to tell them since the 1990s,” Rugola said. He vowed to keep up the pressure on the legislature and on the SERS board and administration to develop other options than solving their funding problems on the backs of hard-working school employees who make about $24,000 annually on average and retire on less than $1,200 per month. For more on the June 7 rally, check out the video below.